Bioassessment is the science of using aquatic organisms as indicators of ecological condition in streams in rivers. Many types of organisms can be used as indicators, for example fish or algae, but bioassessment is most frequently based on benthic macroinvertebrates (BMIs), which are small but visible bottom-dwelling organisms such as insects. BMI data sets typically consist of long lists of species (or taxa) found in a sample and their relative abundances. These data can be simplified into measures of biological condition such as indices of biotic integrity (IBIs) that are designed to be sensitive to human-caused alterations to the landscape, to stream channels and riparian zones, and to water chemistry. IBIs function much like economic indicators: high IBI scores reflect good ecological conditions while low IBI scores reflect poor ecological conditions. Bioassessment is increasingly used throughout California by water quality monitoring programs, but in the Central Valley bioassessment is more challenging than in other regions of the state because the entire landscape and most streams are highly altered by human activities such as urbanization, agriculture and water diversions. This makes it impossible to evaluate how BMIs respond across a complete gradient of human disturbance within the region, that is, from minimally disturbed reference sites where human activity is absent or minimal and which therefore set the benchmark for biological expectations, to the most altered sites with degraded biology. In the Central Valley, minimally disturbed reference sites are no longer available. Even the ‘least-disturbed’ sites, which represent the best-available chemical, physical and biological habitat conditions given the current state of the landscape, are markedly disturbed. Reference sites in other parts of California, such as the Sierra Nevada or the Sierra foothills, may be significantly less disturbed than Central Valley reference sites. In this study, BMI data sets from 11 studies conducted at various intervals over the last 14 years were compiled to build an IBI for Central Valley streams. Data were not collected consistently by the different studies, and many gaps were present in associated physical habitat and water chemistry data sets. This could be corrected for BMI samples by standardizing to a consistent level of taxonomic effort. Gaps in other data could not be addressed. Criteria for defining ‘best-available’ reference sites were established as data allowed and were based on local urban and agricultural intensity, stream channel and riparian condition, and stream substrate composition. Eighty BMI metrics were evaluated for inclusion in the IBI based on 4 criteria: 1) sufficient range for scoring; 2) responsiveness to land use and/or local disturbance variables measured at the 150-meter sampling reach (as data allowed); 3) good discrimination between reference and test sites; 4) lack of correlation with other responsive metrics. Five final metrics were selected and scored for inclusion in the IBI: collector richness (number of taxa that are collector- feeders), predator richness (number of taxa that are predators), percent EPT taxa (percent of taxa that are mayflies, stoneflies, or caddisflies), percent clinger taxa (percent of taxa that cling to vegetation) and Shannon diversity (a composite measure of taxonomic richness and evenness of abundance). The final IBI showed good discrimination between reference and test sites, and was validated with an independent data set. BMI metrics and the final IBI were more strongly related to reach-scale physical habitat variables than to water chemistry or land use variables, but detailed water chemistry was lacking for many sites, and some studies have shown that response to land use diminishes when more than 10% of a watershed is degraded by human activities. Despite data gaps that were less than ideal for indicator development, this study is the first to set expectations for Central Valley BMI assemblages based on best-available reference sites. The Central Valley IBI can be used as a general interpretive framework for benthic samples collected from perennial streams on the valley floor and provides an objective means for rating biological condition in a region with high urban and agricultural intensity. The ability to rank sampling sites relative to explicitly defined biological expectations is essential to any biological monitoring program. Therefore, this index may prove useful in several monitoring applications, including California’s non- point source CMAP program where sampling was stratified to assess and compare stream condition in urban, agricultural and forested watersheds, in stormwater monitoring programs, in point-source pollution investigations, and in stream restoration monitoring. 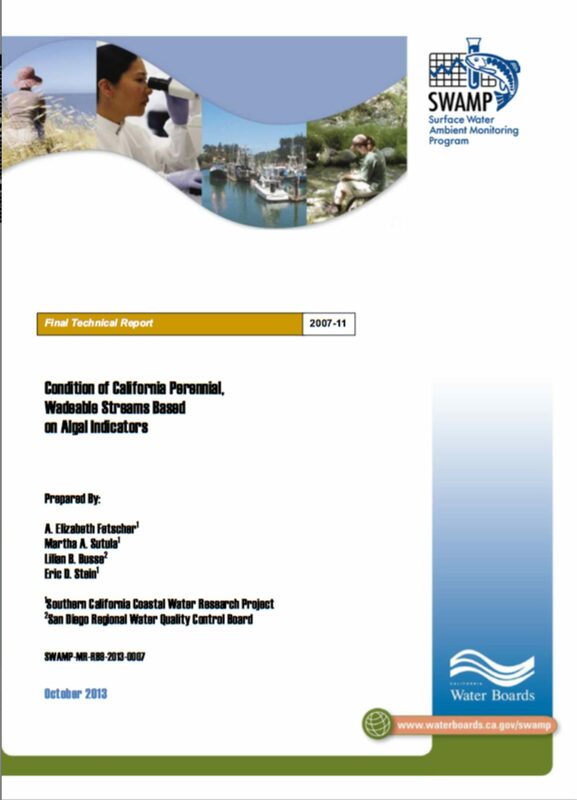 Key recommendations include: 1) that all future bioassessment projects in the Central Valley should collect quantitative physical habitat and water chemistry with consistent protocols at all sites; in situ chemistry and rapid (qualitative) physical habitat are not sufficient for screening reference sites or evaluating BMI responses to stressor gradients; 2) that bioassessment should be added to NPS monitoring where programs are already collecting more intensive stressor data such as pesticides, nutrients and metals. This will provide California’s monitoring programs with better datasets to support future analyses. There are over 4,200 miles of perennial streams in the coastal watersheds of Southern California. Effective protection and management of these resources require an understanding of their overall health (or condition) and the major stressors that affect their condition. 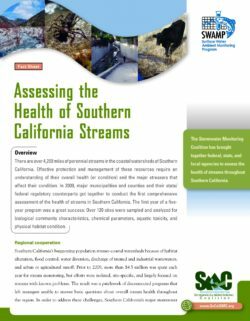 In 2009, major municipalities and counties and their state/federal regulatory counterparts got together to conduct the first comprehensive assessment of the health of streams in Southern California. The first year of a five year program was a great success: Over 120 sites were sampled and analyzed for biological community characteristics, chemical parameters, aquatic toxicity, and physical habitat condition. Depressional wetlands are the most abundant, yet most threatened wetland type in California. Despite their relatively ubiquitous nature, they are poorly characterized, and unlike streams, they are not subject to any systematic monitoring and assessment. Consequently, decisions regarding protection, restoration, and management are usually made without the benefit of any regional context of condition, knowledge of predominant stressors, or rigorous documentation of reference conditions. Ambient monitoring of depressional wetlands can be a critical tool to inform management decisions. However, before such a program can be implemented, biological assessment tools must be evaluated, validated, and modified (if necessary). Once these steps are completed, preliminary assessments can begin to provide answers to critical questions regarding wetland condition and key stressors. 1) to adapt three readily available bioassessment tools for assessing depressional wetland condition in southern California. 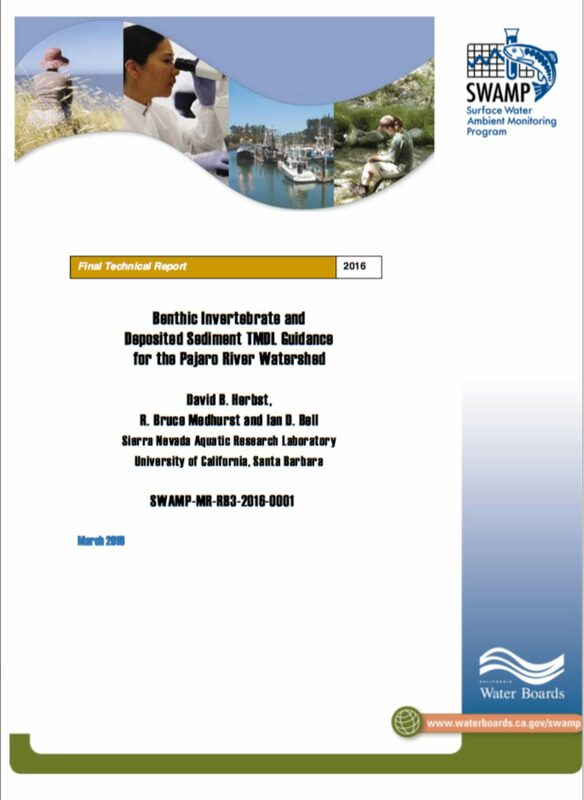 This included a statewide rapid assessment method that had been calibrated and validated for depressional wetlands (CRAM) but had no prior use in a regional assessment program, a macroinvertebrate index developed for depressional wetlands from a different geography (northern California), and a benthic diatom index which had been developed for a different habitat type (wadeable streams). 2) To evaluate the regional condition of depressional wetlands in southern California using the adapted tools. 3) To evaluate the relationship between condition and stress by sampling both local stressors (intensity of direct wetland use, water chemistry and sediment toxicity) and landscape stressors (adjacent land use, flow diversions, road density). Once achieved, these goals should establish the foundation for developing a robust and ongoing depressional wetland ambient monitoring program. 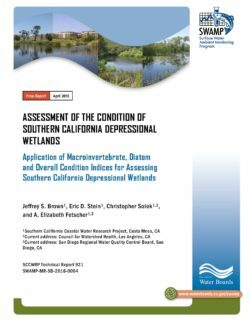 This study included perennial or seasonal depressional wetlands as defined by Brinson (1993) located within the boundaries of the Los Angeles, Santa Ana, and San Diego Regional Water Quality Control Boards. Wetlands were not considered for this study if they were concrete-lined, marine-influenced, treatment ponds, livestock wastewater ponds, riverine (i.e. dominated by riverine hydrology), dry (i.e. not seasonal), or on-military bases (due to access issues). Vernal pools were also excluded; while these are considered a subclass of depressional wetlands, they represent a distinct wetland habitat that is typically evaluated with specific methods. Furthermore, given their rarity and ecological sensitivity they are often assessed through focused studies. The Pajaro River and its tributaries are exposed to sediments from a variety of sources. To establish limits for regulating this pollutant, it is necessary to understand how and where deposition of sediments impact biological health. Benthic, or bottom-dwelling, invertebrates offer a direct way to assess the impacts of deposited sediment on the integrity of stream ecosystems. The channel bed is where sediments accumulate and persist, so benthic macroinvertebrates that live in this ha bitat provide a responsive indicator of the effect of these sediments. Previous criteria for bedded sediment fines in spawning gravels have been established for salmonids, but these may not be appropriate to all stream segments, are not typically measured in stream assessments, and are confounded by other factors limiting steelhead vitality. Instead, the effects of sediment cover can be evaluated using benthic macroinvertebrates (BMIs) as indicators of stream condition to assess any stream segment and can be related to the bioassessment and stream habitat surveys of the Surface Water Ambient Monitoring Program (SWAMP) . The approach taken in this study was to select 25 sites throughout the perennial Pajaro watershed and in the adjacent upper Coyote Creek watershed that represented a cross-section of land uses, above and below reservoirs (unregulated/regulated flows), and in varied geographic settings that would permit examining source area influences on sediment deposition. Rather than define conventional TMDL estimates for daily loads of sediment, a more relevant survey of the cover of deposited fine and sand (FS) sediments on the stream bed was used here to find the level at which BMIs lost integrity of species c omposition and diversity. BMI responses we re-examined at the reach scale (50-meter channel length ) and at local patch scales (30x3 0 cm) of varied FS sedim ent cover . The data were used to define target levels at which sediment impairs stream bed habitat quality. Reaches of varied sediment cover were compared to conditions at relatively undisturbed reference streams of the Central Coast region to evaluate sediment impacts. Significant loss of species diversity and altered community type occurred above a sediment cover range of 40% FS at both reach and local-patch scales. In a range of 20-40% FS , BMI diversity declined, showing incipient losses of biological integrity . Richness of mayfly, stonefly and caddisfly taxa richness (EPT) was used as an indicator of biological effects of sediment, and reduced diversity associated with sediment increase corresponded to declines below the criterion 10th percentile of reference site EPT found in other central coast streams . Because of multiple stressors, some streams may not achieve these sediment or EPT targets just by improving the local sediment condition . For example, streams that are regulated (below reservoirs) or in arid regions may be influenced by temperature, dissolved minerals and/or elevated pH , in addition to sediment . Rankings of streams surveyed were based either on sediment cover within the wetted stream width or the entire bankfull channel profile, accounting for both current habitat conditions and recent environmental exposure . Although the design of this study examined sediment deposition at different spatial scales and used a variety of sediment measures, the results are compatible with habitat and bioassessment surveys using standard SWAMP protocols. Only three to five of the 25 streams surveyed in the Pajaro region showed sediment and diversity levels indicating likely sediment deposition impacts. Results from this study can be used to identify streams where sediment degradation to biological integrity is likely (at >40% FS) , and those in a warning range (20-40% FS) that should be flagged for further assessment. The Colorado River Basin Regional Water Board conducted bioassessment sampling at high-quality (i.e., “reference”) streams in their region during 2013-2015. The purpose of the study was to characterize the biological condition of these streams, which had never been done before, and to expand ongoing research as to whether existing biological indices, developed primarily for perennial streams, apply in nonperennial streams. The latter are usually excluded from bioassessment surveys, but make up the majority of stream length in the most arid parts of the state like the Colorado River Basin, leaving stream condition assessments in such regions largely incomplete. The indices evaluated were the California Stream Condition Index (CSCI) based on benthic macroinvertebrates and the first to have statewide applicability in perennial streams, and the D18 and S2 indices for diatoms and soft algae, respectively, developed for use in perennial streams of southern coastal California. Sixteen sites were sampled during the 3-year period, and data loggers that measure water depth were deployed for 2 of the 3 years to characterize the hydrologic regime at each site. Most sites were nonperennial, but a few were spring-fed perennial oases. Fourteen of the sites passed formal reference screening criteria developed by statewide programs. The CSCI and S2 indices had generally good applicability in the region, with most samples from reference sites indicated either good or fair (i.e., non-degraded) biological condition. The mean CSCI score at regional reference sites was slightly lower than the statewide mean (i.e., 0.90 vs. 1.0, respectively), but the difference could be an artifact of a relatively small regional data set. The fact that CSCI and S2 performed as well as they did in a region, and in a set of stream types, largely excluded from their development indicates that the indices can be used in nonperennial streams (and spring-fed oases) in the Colorado River Basin as long as certain minimum flow conditions are met, such as sustained flow for several weeks prior to sampling and sufficient wetted width to employ existing protocols developed for perennial streams. By contrast, the D18 index did not perform well in the region. A majority of samples from reference sites indicated poor or very poor biological condition when condition thresholds based on statewide data sets were used, but even when more relaxed thresholds based on just south coast reference sites were applied, the number of reference sites in good or fair condition was still much lower than expected. This was not a result of regional reference sites being of low quality, but was most likely an artifact of applying the index to a set a stream types unintended for its use. Development of statewide algal indices is underway, which may improve the performance of diatom indices in the southern desert. 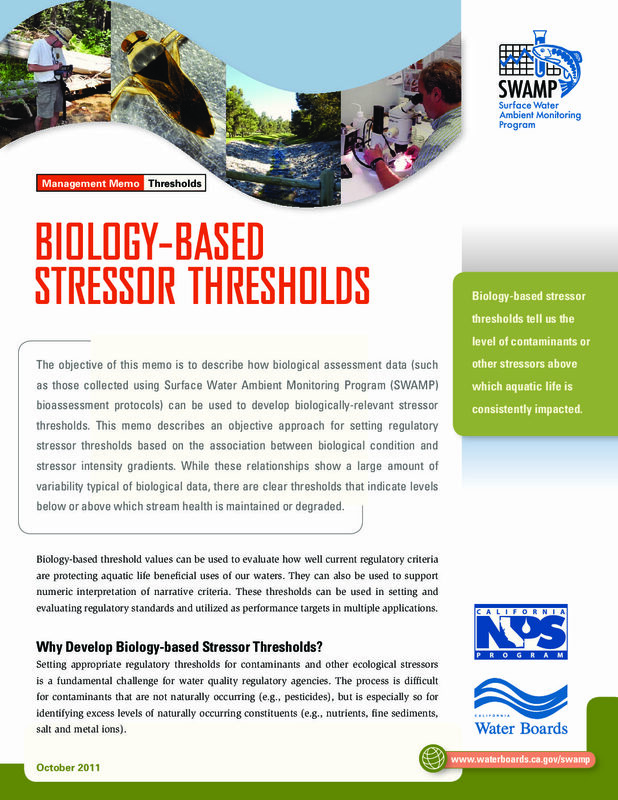 The objective of this memo is to describe how biological assessment data (such as those collected using Surface Water Ambient Monitoring Program (SWAMP) bioassessment protocols) can be used to develop biologically-relevant stressor thresholds. This memo describes an objective approach for setting regulatory stressor thresholds based on the association between biological condition and stressor intensity gradients. While these relationships show a large amount of variability typical of biological data, there are clear thresholds that indicate levels below or above which stream health is maintained or degraded. Algae can serve as indicators of stream ecological condition in two ways. Information about algal community composition can be used for bioassessment analogous to the way in which benthic macroinvertebrates (BMIs) are employed (e.g., as described in Ode et al. 2011). When algae occur in excess (i.e., in the case of eutrophication), stress to the system can result; as such, the total amount of algae present also becomes an indicator of stream health in its own right. To date, the state of California has invested in several initiatives to build capacity for conducting stream algal assessment. This includes support for creation of a planning document funded by State Water Resources Control Board’s (SWRCB) Surface Water Ambient Monitoring Program (SWAMP) (Fetscher and McLaughlin 2008) and establishment of SWAMP Standard Operating Procedures (SOPs) for field sample collection (Fetscher et al. 2009) and a laboratory processing and enumeration SOP (currently in review) for determining algal community composition. In addition, an algae Index of Biotic Integrity (IBI) for bioassessment of southern California streams was recently completedby Fetscher et al. (2013), and a state algae laboratory, based at California State University San Marcos, has been established. Over the past several years, the state of California’s Perennial Stream Assessment (PSA)and Reference Condition Management Program (RCMP), the southern California Stormwater Monitoring Coalition (SMC), and other smaller programs have collected and processed algae samples using the SWAMP protocols. As such, a substantial amount of standardized data on stream algae and instream, vascular macrophytes (together hereafter referred to as stream “primary producer indicators”) have been collected in California since 2007. However, no consolidated analysis of these data has been conducted so far. This report represents such an effort. The struggle to adequately monitor the condition of waterbodies with limited financial resources is a challenge faced by water resource agencies worldwide. For a resource agency to adequately meet its obligations to monitor and assess the condition of its waterbodies it must provide information at both the site-specific scale and the scale of the entire resource. This dual obligation requires different monitoring strategies. Traditional targeted monitoring (in which site locations are selected to meet specific monitoring goals) is essential for answering many key water quality monitoring questions (e.g., what is the condition of specific sites, how do site conditions vary seasonally and annually, where are the best and worst sites, what are the primary water quality problems at specific sites, what are the effects of specific watershed activities and/or BMPs). Although this approach can generate much valuable water quality data, it is unable to provide information about the overall condition of large populations of resources (e.g., all streams, lakes or wetlands in a state) unless the monitoring entity is prepared to perform a complete census of the targeted resource. Site specific monitoring approaches are also unable to provide an objective context for interpreting the data they generate. However, the perspective provided from this context is a necessary logical foundation for a sound monitoring program. In the US, the need for a broader context for interpreting the results of targeted monitoring data has driven the development of alternate sampling designs at both the state and federal level. To meet this need, the U.S. EPA established its Environmental Monitoring and Assessment Program (EMAP), a long term research program designed to develop the tools and techniques needed for cost-effectively answering the fundamental status and trends questions in the Clean Water Act. The EMAP studies are based on a probabilistic survey design in which each sampling location represents a known proportion of the total resource of interest (e.g., percent of total stream length) with known statistical confidence. This design permits the inference of resource conditions for large geographic regions with a relatively small investment in sampling (Ringold et al. 1996, Olsen et al. 1999, Stevens and Olsen 2004). After completing assessments of the condition of Eastern lakes and the condition of wadeable streams in the Middle-Atlantic states, the EPA initiated a similar assessment of streams in the western states (WEMAP), which included a high density of sites in California. For the first time in 2006, the state of California used data from a probability survey to derive the condition assessments of its perennial streams in its 305(b) report to the US EPA (Ode and Rehn 2005, California State Water Resources Control Board 2006). These reports were developed to meet California’s obligation to monitor its compliance with the goal of biotic integrity stipulated under Clean Water Act §305(b). Prior to these report, the ABL has presented results of the Southern Coastal California intensification area (Rehn and Ode 2004), Northern Coastal California intensification area (Rehn et al. 2005) as demonstration projects. As the EPA’s Western EMAP sampling effort ended in 2003, the EPA strongly encouraged western states to continue the EMAP monitoring approach in their own state monitoring programs. 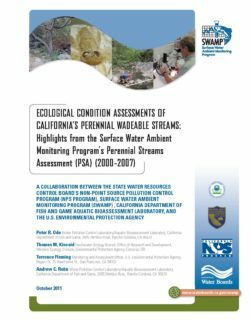 Two monitoring programs in the California State Water Resources Control Board, the recently established Surface Water Ambient Monitoring Program (SWAMP) and the Non-Point Source Program (NPS) expressed interest in probabilistic sampling. In concert with (and with funding from) their counterparts in the EPA Region 9 Non-point Source Programs and Office of Water, NPS and SWAMP developed the California Monitoring and Assessment Program (CMAP) to provide an additional four years of statewide probabilistic sampling to support continued ecological condition assessments. The study designs used for these condition assessments were developed by the EPA’s Office of Research and Development. Since the state and federal NPS programs brought a strong interest in the relationship between non-point source pollution sources and aquatic life use, the sampling design was adapted to include an explicit stratification by landuse/ landcover. 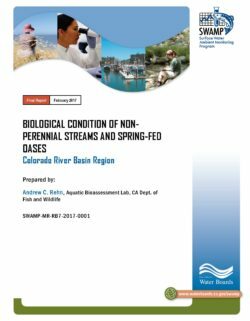 Since 2000, California has conducted three successive probability surveys of its perennial streams and rivers, each with a focus on biological endpoints. These surveys are now combined and are managed collectively by the Surface Water Ambient Monitoring Program (SWAMP) under its Perennial Streams Assessment (PSA) program. In 2010, SWAMP’s Perennial Streams Assessment (PSA) conducted the State Water Board’s eleventh continuous year of probability monitoring of perennial, wadeable streams. To date, the program has collected biological data (invertebrates, algae) and associated chemical and habitat data from approximately 850 probabilistic sites statewide. These surveys have produced a wealth of data that can and should be used to inform many decisions made by California’s water resource agencies. 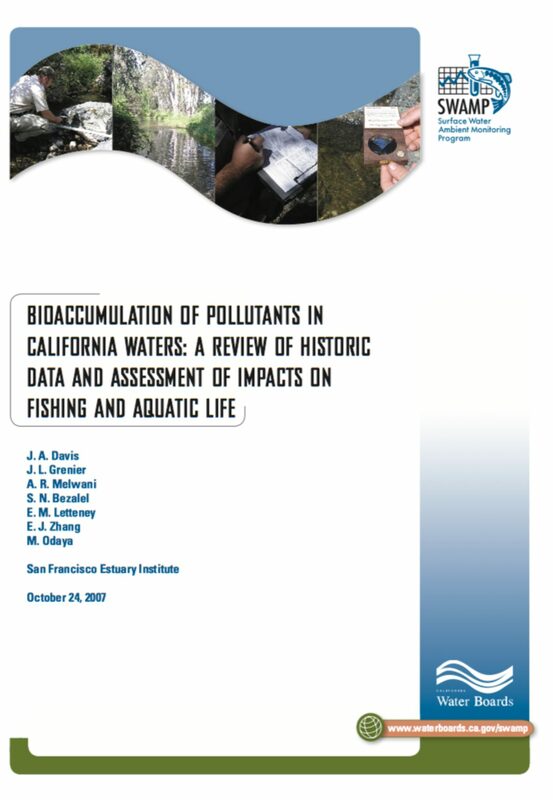 For example, the assessments in the 2006 California Water Quality Assessment Report (Clean Water Act Section 305(b) Report) were based in large part on data from these surveys. Data from these surveys were also used in the development of the 2010 Integrated Report. This report highlights some of the most significant results from the first eight years of PSA and demonstrates some ways that these data can go beyond 305(b) and 303(d) applications to improve California’s water quality programs. The results presented in this summary represent just a fraction of the potential uses of data generated by these ongoing surveys. As the data et becomes more robust, it will continue to support multiple uses for years to come. 1. What is the condition of California’s streams? 2. Is stream condition changing over time? 3. What is the relative condition of streams draining agricultural, urban and forested regions? 4. Which stressors have the strongest associations with biological condition? 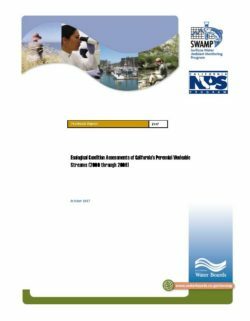 Future SWAMP reports will highlight the application of PSA data to various State Water Board water quality programs, including links to regional monitoring objectives.